A note from FishDuck.com: Today we have a unique treat, this article from a highly successful college coach gives an inside perspective football fans don’t get to see, the direct perspective of the coach. We encourage other coaches that are interested in possibly writing guest columns providing their unique insight to please contact us. For now, here is Coach Joe Daniel! Over the past few seasons, we have seen an increasing number of teams spreading the field and running the Zone Read play. Spread Offensive teams try to create confusion among the defense by bringing the tailback into a mesh with the quarterback, drawing the attention of the linebackers, delaying the hand-off point to see how the defense will react and attacking in response to the reaction of specific defenders. The mesh point functions essentially in the same manner as the option pitch worked in the triple option attack. The quarterback is reading the defense with one or more options of what to do with the ball depending on how the defense reacts. In option attacks, this was accomplished by pitching the ball, while with the zone read mesh rather than pitching the ball it is an elongated hand-off. The quarterback may read any number of defensive players and decide whether to keep the ball or hand-off, but most commonly it is the weak-side defensive end being zone-read while the QB is in the mesh with the tailback. If read and executed properly, it essentially makes the defender wrong every time, regardless of their reaction. However, there are counters to this base attack, defensive maneuvers aimed at disguising or disrupting the zone read. Our team has learned to use our 4-3 Defense to scheme the opponent, forcing the offense to make decisions rather than reacting to the defense. By dictating to the offense to make a decision first, the basic schematic philosophy and advantage behind the zone read play can be neutralized. The first key to defending the zone read is understanding what the offense looking for, specifically which player is being read. By understanding how to disguise or confuse, recognition of what the offense is reacting is vital to comprehending how to scheme against it. To successfully defend the Zone Read, opposing coaches need to get inside the mind of the offensive coordinator and the key offensive players. As the quarterback is making the read, they are looking for one of two things: either the shoulders of the weak-side defensive end turn in, in which case the QB is going to keep the ball and try to run around him, or the shoulders of the defensive end stay square, at which point the quarterback is instructed to give the ball to the RB every time. Once the give happens, the deception of the play is over, it becomes a simple inside zone play. The offensive goal by the mesh observing the defensive end is to neutralize his chances of making a play based on the shoulder position, reacting to his position by attacking in a way that they cannot make a play to stop the runner. Essentially, the defensive end is “blocked,” removed from the equation, without having to utilize an actual blocker to account for them, by presenting the threat of a quarterback run which the defender must in theory position themselves to stop. There are several ways to defend the zone read, but for an offense that is predicated on reacting to the defense’s initial reaction, I find the most useful and simple way to teach methods of stopping it is by preventing over-reaction, making very few changes to the defense. By always aligning the four-man front in a 4-3 with the 3-technique defensive tackle (T depicted above) aligned opposite the single back, the defensive end (E depicted above) is taught to treat any down blocks (blocking away from him) by the tackle as “Run-away,” the proper reaction being to chase down the line of scrimmage. In this manner, the end can be responsible for taking away any cut-back lane to the B-Gap. The nose guard (N depicted above) is responsible for the weak side A-Gap. 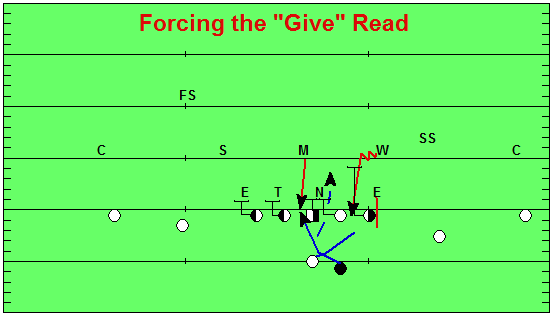 If the middle or “Mike” linebacker (M depicted above) reads the running back going to the strong side, they then immediately plug the strong A-Gap. By doing this, all gaps are then accounted for in terms of the inside zone. For the quarterback, the action of the defensive end in this scenario is a sure “Keep!” read, which is exactly what the defense wants the QB to think. The offense is simply giving the defense a free shot on the quarterback. The weak-side or “Will” linebacker (W depicted above) is the only player in the system that has a change in approach here in reacting to the zone mesh. Normally, when the backfields flow away from the will backer, they would position themselves accordingly to anticipate the possibility of the ball carrier to cutback. But with proper understanding of the zone read play, matched with the knowledge that the weak-side defensive end is bending to takeaway the B-gap, the Will can now play directly reacting to the option. Even for the zone read, stopping the option is all about assignment football. The Will linebacker will sprint immediately to the quarterback and strike a blow. They need to fit tight to the end of the line of scrimmage, so that there is no space underneath him for the QB to cut inside. Stay close to the line, denying a gap to the inside, and run right at the quarterback. In this 1-on-1 tackling situation, the linebacker must win most of them. 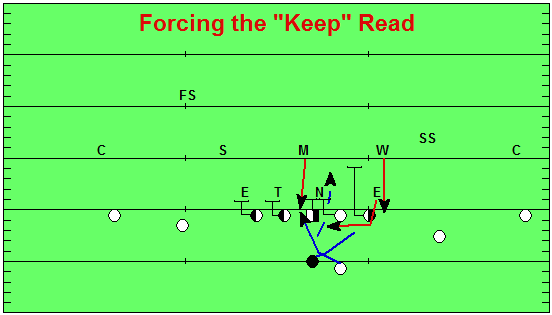 The safety (SS depicted above) can come up to help, but if the Will linebacker is not as athletic as the quarterback, then the defense must consistently change the read to get him to give the football to the running back rather than keep it. By understanding the zone read play, the defense can influence the offense to get the ball to whom the defense wants to possess it. For many teams today, the quarterback is the best athlete on the field, and if the athleticism cannot be matched in a 1-on-1 situation with the linebacker, then it is far better that someone else carry the ball into the bulk of the interior line of scrimmage. To make this happen, the defense can make a “Q” check to the defensive end. By tagging “Q” to the defensive play call, the weak-side end, if left unblocked in the zone read blocking scheme, does not chase down the line. Instead, they just squat in their spot and find the quarterback. The “Q” check also tells the Will linebacker to play their more traditional role, shuffling in anticipation for the threat of the cutback run. Against running backs that really like to cut back across the grain or on counters, the defense will have the Will linebacker fill the weak B-Gap immediately upon reading the zone read mesh point in the backfield while the quarterback is making their read of the defensive end. By not turning the shoulders and chasing the quarterback, the end is forcing the quarterback to immediately make a “Give” read, removing any deception of who will be carrying the ball if the quarterback makes the proper read. While the specific read for the quarterback is not universal, if the QB sees that the end is not going to attack the running back, the obvious response is to hand it off. By doing this, the defense determines the reaction of the mesh, not the offense, and can scheme accordingly to strategically position defenders to stop the running back for minimal gains. Defending option offenses is all about discipline in the defense above all else. The players must be able to understand the scheme, and execute it, in order to be successful. 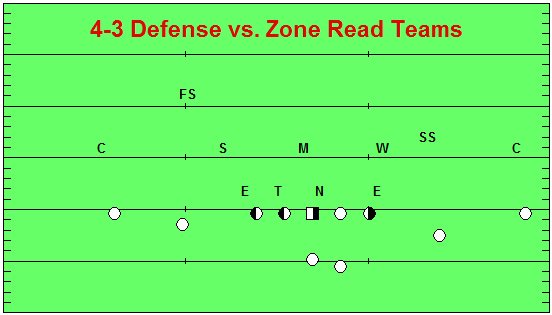 The offense is relying on the defense being confused, or overreacting, or playing out of position, which is also why so often teams that implement a zone read scheme do so simultaneously as a fast-paced no-huddle attack, hoping that not permitting substitutions or time to align fully will lead to misreads. Basically, for the play to be effective, the defense has to screw up. The offense is depending on that confusion, that out-of-position over-reaction, but by remaining disciplined in the set defense keeping things basic, the defense is instead dictating to the offense how the play will develop, giving any defense a chance to stop the zone read. 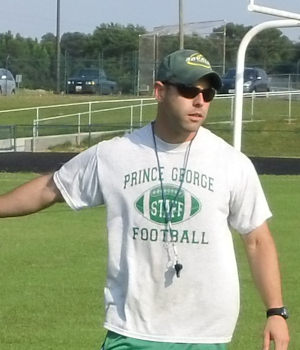 Joe Daniel is the author of Football-Defense.com, a website for defensive minded football coaches. You can browse over 50 free articles and videos, or join over 200 coaches in their huge membership section today.